Starting the conversation about end-of-life options is extremely important for individuals and their families. The best time to start the conversation is before it is needed; however, this isn’t always the case. When trying to talk with anyone about end-of-life options as the end of life approaches, individuals may seem resistant, confused or overwhelmed. While this is a common response, being able to have open and honest conversations is imperative as people navigate through their healthcare and tend to their medical needs. Having a healthcare and end-of-life options discussion may be hard to initiate and can make people feel uncomfortable, sad or scared. Call a professional. Have the doctor or a hospice employee arrange an informational discussion with the individual and family. Reassure them that it is only to share information, learn about options and ask questions. There may not be a “perfect” time. Begin the discussion over dinner or at a family gathering by having them choose a healthcare power of attorney and create a living will. These two documents are known as an advance directive. This is important for everyone to have, not just someone with a terminal illness. If they already have one, ask them to pull out their documents for review and ensure everyone knows where these documents are kept. Also, share with your doctor. Be honest. If you get the chance to talk to someone before they need end-of-life options, explain why it’s so important to you and why you think it will be beneficial to them. Explain that you want to know what their wishes are and that you want to honor their wishes. Explain that you don’t want them going through this alone. It isn’t easy for you, but you want what’s best for them. Hospice of Southern Illinois understands it can be difficult to address end-of-life options. We are here if you need to talk more about end-of-life care. 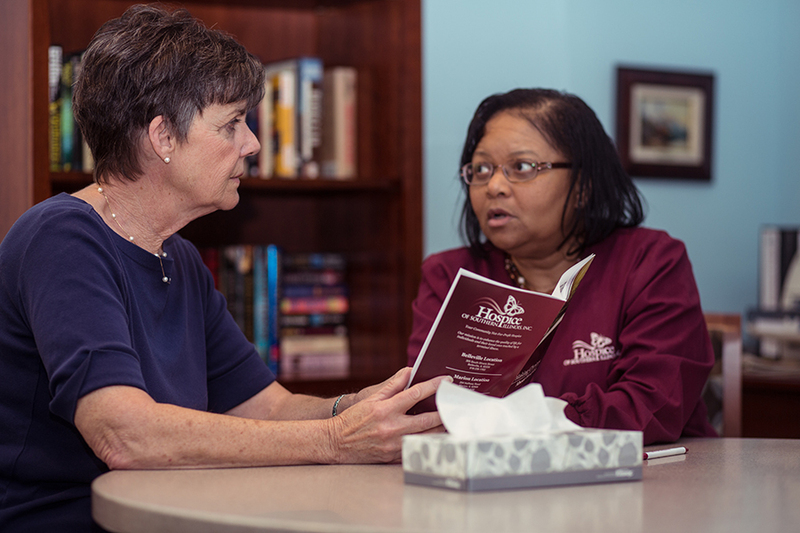 Do you want to learn if Hospice of Southern Illinois’ care would benefit someone in your life? With no obligation, please call, 1-800-233-1708, or visit our website, www.hospice.org, to access free resources. Our mission is to enhance the quality of life for individuals and their loved ones touched by a terminal illness. There comes a time… to ask how hospice can help.